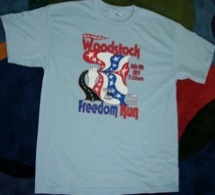 On July 4th, 2011, I ran the Woodstock Freedom Run. This was my first disciplined attempt after switching over to the minimalist run. I was not sure what to expect. Last time I ran in this race, the route was not full 3.1 miles – it was more like 2.9 mile. This time, the corrected it to cover full 3.1 miles. Posted one of my fastest run at 7:45 pace (24 min 09 sec). There were great festivities going on there. The mayor came and started us off from the top of the fire engine ladder which had extended from the road to the top of the main street intersection! !